Orofino Physical Therapy was founded in 1999, in Boise, Idaho by Chip Sands and Darin Tucker. Both have strong backgrounds in sports medicine and have been Certified Athletic Trainers and Certified Strength Conditioning Specialists. Each of the founders have worked with athletes ranging from high school, collegiate, professional and Olympic venues. Orofino Physical Therapy is a spacious 6,000 square foot facility that sits in the heart of Orofino Idaho just off the Clearwater River. OPT has been providing physical therapy services to the community since 1999 and in 2014 added a 24 HR Wellness Center. 1. Physical Therapy services are provided by licensed therapists. Their expertise range from those minor aches and pains to post surgical cases. Services are provide from 8 – 5 M-F or by appointment. It is the only physical therapy clinic in Orofino that is open 5 days a week, so there is no waiting to get an appointment. 2. 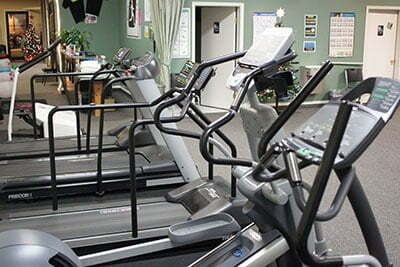 24 Hour Wellness is also available allowing the community get in shape at times that work best for them. Classes and dvd programs are also available. Orofino Physical Therapy has a wide variety of equipment which includes cardio equipment (bikes, stair climbers, elliptical machines, rowing machines, tread climbers, treadmills) machine weights, free weights, TRX bands, etc. The facility has 7 TVs and sirus radio that can be used by all patients and members. Showers are also available allowing you to work out before work or during lunch.